Sealaska Heritage Institute (SHI) will showcase contemporary masterpieces of Northwest Coast art at its second art auction in an effort to perpetuate critical programs such as Native language revitalization and workshops on endangered Native art forms. Funds from the proceeds will build SHI’s new endowment to ensure art, language and education programs live long into the future, especially in this era of uncertain fiscal times, said SHI President Rosita Worl. The auction is also part of SHI’s effort to make Juneau the Northwest Coast art capital of the world, she said. “The material culture left by our ancestors is unparalleled. Nothing on Earth compares to the great Northwest Coast totem poles and clan houses or to the intricate Chilkat and Ravenstail woven robes that can take years to complete. Nothing rivals the formline designs that make the art of the Tlingit, Haida, and Tsimshian so unique. It should be declared a national treasure,” Worl said. The event also is meant to educate people about fine Native art from the Northwest Coast area. 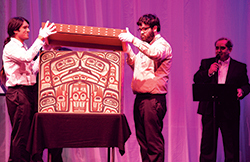 SHI’s Native Artist Committee—comprised of the internationally-renowned artists Nathan Jackson, Delores Churchill, Nicholas Galanin, Da-ka-xeen Mehner and Steve Brown—invited artists from a wide range of mediums to donate a unique piece of art to the auction. Alaska Native artists outside the Southeast region also are welcome to participate. Collectors who own Northwest Coast or Alaska Native art pieces that they would like to donate to the event are invited to email a photo and or description of the piece to carmaleeda.estrada@sealaska.com. The auction will be held Sept. 29, 2017, at Centennial Hall in Juneau. Established Northwest Coast artists and collectors who want to participate in the auction should contact SHI now. SHI’s premier Tináa Art Auction in 2014 raised more than $300,000 to help build the Walter Soboleff Building. Artists donated more than 50 pieces for the event. Caption: Carved and painted bentwood chest by David A. Boxley, who donated it to the 2014 Tináa Art Auction. Photo by Steve Quinn courtesy of Sealaska Heritage Institute.